This post about Sri Durga/Parvati/ Kali is probably debatable as people have their own beliefs. Below is some information I collected, in places rewrote and tried to make sense of. If I goofed I apologise. If you want to add anything or have me change anything please let me know. I’m trying to give an overview of generally accepted belief. Sri Parvati is the consort of Lord Shiva and exists in various forms. In her fierce warrior aspects, the most commonly worshipped forms are Durga and Kali. These are avatars taken by the Goddess in an effort to destroy a form of evil. Goddess Parvathi is Lord Siva’s consort & like Lord Siva, she is portrayed in bothterrifying & serene aspects. In her serene aspect, she is depicted as Parvathi & is usually seen along with Siva and their sons Lord Ganesha & Lord Muruga/ Subramanya and daughter Jyoti.. She is seen with only two hands, holding a blue lotus in her right hand. SriDurga is depicted wearing a red Sari.Her vahana (vehicle) is a Lion/Tiger and she is sometimes seen as standing on a lotus or on a buffalo’s head. She has four – twenty arms andcarries many objects in her hands. The red colourof her clothes represents action and that she is always busy destroying evil and protecting mankind. A tiger symbolizes unlimited power. Durga riding a tiger indicates that She possesses unlimited power and uses it to protect virtue and destroy evil. The eighteen arms of Durga signify that she possesses combined power of nine incarnations of Lord Vishnu that have appeared on the earth at different times in the past. 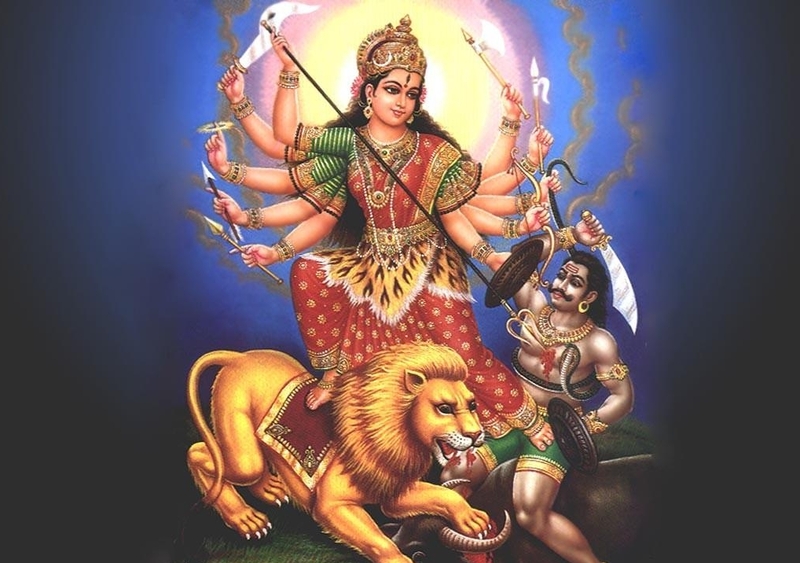 Weapons in the hands of Durga such as a mace, sword, disc, arrow, and trident convey the idea that one weapon cannot destroy all different kinds of enemies. Different weapons must be used to fight enemies depending upon the circumstances. For example, selfishness must be destroyed by detachment. Goddess Durga preserves moral order and righteousness by destroying bad aspects of human nature such as selfishness, jealousy, prejudice, hatred, anger, and ego. Goddess Durga killed the powerful demon Mahish and all his great commanders. 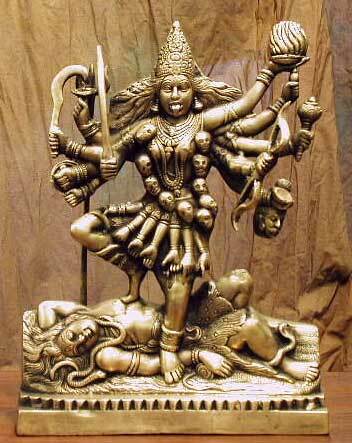 When demonic forces create imbalance all gods unite becoming one divine force called Shakti or Durga. According to the Markandeya Purana, Durga was created by Brahma, Vishnu and Shiva, to fight the demonMahishasura. Through prayers to Brahma, Mahishasura was given the boon that he could not be defeated by any man or god. With this power he unleashed a reign of terror on earth, heaven and the nether worlds. Each god gave her their own most powerful weapons, Shiva’s trident, Vishnu’s discus, Indra’s thunderbolt, Brahma’s kamandal, etc. Himalayas gifted her a fierce white tiger. During the night of the 8th/9th day of the waxing moon, Chanda and Munda came to fight the goddess. She turned blue with anger and goddess Kali/Chamunda leaped out of Durga’s third eye. Kali’s dark and powerful form killed the demons with her sword. This form of the divine goddess is worshipped during the sandhikshan of Durga Puja festival, as sandhi/chandi puja. Finally on the tenth day of waxing moon, goddess Durga killed Mahishasura with her trident. Durga is worshiped during an annual festival called Durga puja, especially popular among Bengalis. The day Durga killed Mahishasura is celebrated as Vijaya Dashami –meaning the tenth day of victory/victorious tenth day. The actual period of the worship however may last from 5 to nine days before this depending on the region. Nine aspects of Durga known as Navadurga are worshipped during the nine-day festival. In Gujarat, the Garba dance is performed to celebrate the victory of Durga,on the last day of Navaratri. Kali she presents the most terrifying aspect of the Goddess, usually seen in a burial or war field. Being the destroyer of Chunda and Munda, she is known as Chamundi. She was created by Durga to help in the fight against demons. In the images commonly worshipped, Kali is shown as an extremely black female with four arms. In one hand she has a scimitar, in another the head of a demon, which she holds by his hair, the third hand is spread flatly open bestowing blessings and in the fourth she holds another weapon, usually a spear or a trident. She has a necklace made of skulls and wears two heads of demons as earrings. Blood is also seen streaming from her tongue and upon her body. 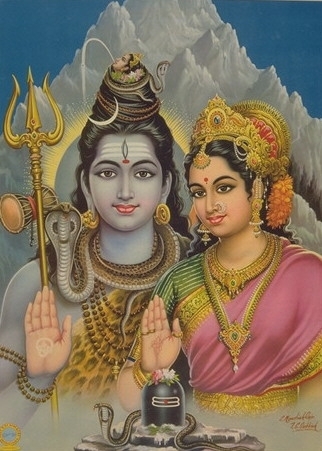 She is shown standing with one foot on Shiva’s chest and the other rests on his leg. In some statues, she is naked except for her ornaments and wears a kind of skirt made of hands of the demons strung around her waist. Animal sacrifice used to be, and in some parts of India today, is done for Kali to please her. She is considered to be the favourite goddess of the dacoits, who believe that they will be saved from all dangers by the grace of Kali. At Kali Ghat, near Calcutta the most celebrated image of Kali is situated. Other forms of Kali are Chamunda, Shamshan Kali (goddess of the cremation ground), Bhadra Kali, Ugra Chandi, Bhima Chandi, Sidheshvari, and Sheetla (the goddess of smallpox). People also worship her to protect their children from dreaded diseases and their homes from ill omens. Thanks for this info. I do have to say, I feel Kali Ma is grossly misunderstood! The way she is portayed and viewed in western culture is quite offensive. For example, Indiana Jones 2. Not sure what the title of the movie is, but would love to know. I’d like to see all of it. Yep kali is very misunderstood. Indi didn’t help hindus movie attendance with that one. Also I assumed the stones he was trying to find were lingham. Yeah the filmmakers really dropped the ball. I’ll take a look a video when I’m on a pc. Thanks.